There are 26 Assisted Living Facilities in the Vacaville area, with 8 in Vacaville and 18 nearby. The average cost of assisted living in Vacaville is $3,187 per month. This is lower than the national median of $3,346. Cheaper nearby regions include Fairfield with an average starting cost of $2,834. To help you with your search, browse the 102 reviews below for assisted living facilities in Vacaville. On average, consumers rate assisted living in Vacaville 4.4 out of 5 stars. Better rated regions include Suisun City with an average rating of 5.0 out of 5 stars. Caring.com has helped 8 families in Vacaville find high-quality senior care. To speak with one of our Family Advisors about assisted living options and costs in Vacaville, call (855) 863-8283. Promotion ends in 256 days! C & C Residential Care Home Inc.
Vacaville, CA is a small, suburban town located near the cities Sacramento, San Francisco, Napa, and Delta. Vacaville's senior communities, which are called Residential Care Facilities (RCFs) for the Elderly provide 24-hour personal care and assistance with activities of daily living. RCFs are licensed and regulated by the California Department of Social Services - Senior Care Licensing. There are a total of eight RCFs located in Vacaville with another 53 located nearby in Napa, Rio Vista and American Canyon. The cost of living in Vacaville is 43.9 percent higher than the U.S. average. Although this is mostly reflected in housing costs, which are 110 percent higher than the national average, seniors will find themselves spending more on expenses such as health and transportation since both are more than 10 percent above the national average. The Vacaville area is home to world-class medical facilities, including North Bay VacaValley Hospital, in case of medical emergencies or illness. Vacaville has an array of community resources for seniors, including SolanoCares4Seniors, an organization that provides seniors with access to local services, information on senior-specific topics and social events, as well as two senior centers, one of which is specific to seniors with Alzheimer's disease. The weather in Vacaville is comfortable year-round. Summertime highs are around 93 degrees, which is even warmer than California's average summertime high of 87.9 degrees and much warmer than the U.S. average summertime high of 86.1. In the wintertime, Vacaville's average high is 38 degrees, while the U.S. average is a mere 22.6. City Coach provides seniors with a safe and accessible public transportation option to get around Vacaville. Discounted senior rates are available. The state of California doesn't tax social security income, which leaves seniors with additional funds to help cover the cost of assisted living. Assisted Living costs in Vacaville start around $3,187 per month on average, while the nationwide average cost of assisted living is $4,000 per month, according to the latest figures from Genworth’s Cost of Care Survey. It’s important to note that assisted living rates in Vacaville and the surrounding suburbs can vary widely based on factors such as location, the level of care needed, apartment size and the types of amenities offered at each community. 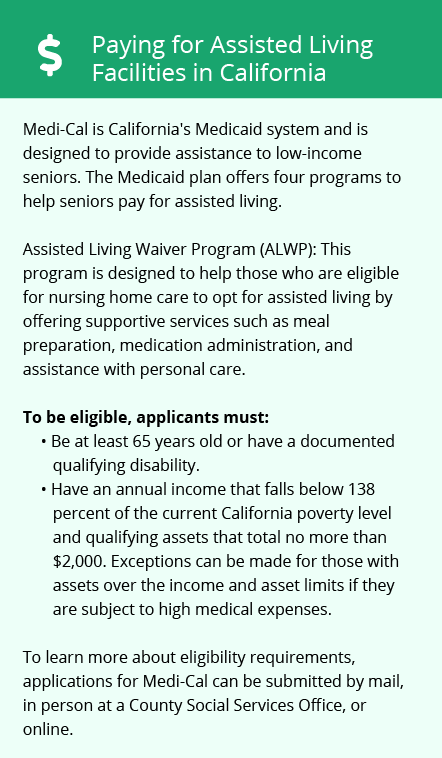 California's Medicaid 1915(c) Assisted Living Waiver is available to eligible seniors to assist with paying for services provided in residential care facilities. Seniors requiring assistance with room and board costs may apply for an optional supplement (OSS) to their Supplemental Security Income (SSI). 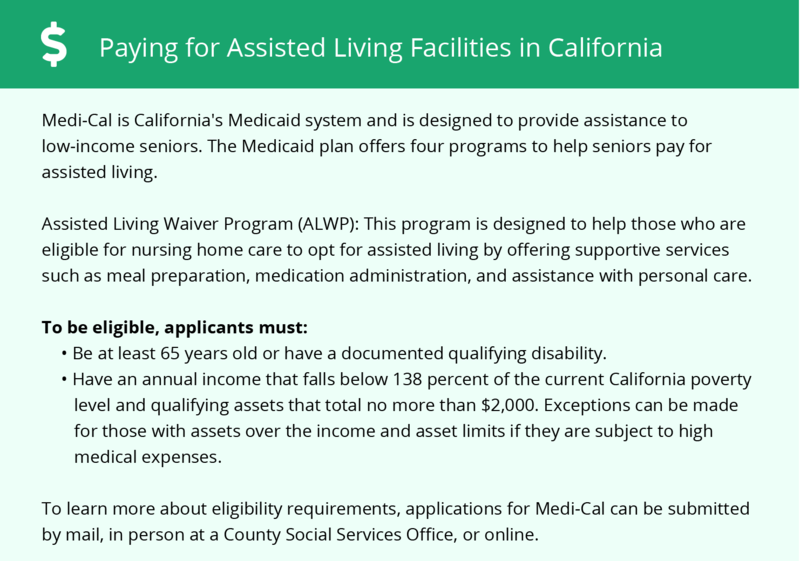 In California, facilities may not charge room and board fees that exceed any Medicaid eligible senior's combined SSI and OSS less a personal needs allowance, which as of 2014 was $131 monthly. Vacaville and the surrounding area are home to numerous government agencies and non-profit organizations offering help for seniors searching for or currently residing in an assisted living community. These organizations can also provide assistance in a number of other eldercare services such as geriatric care management, elder law advice, estate planning, finding home care and health and wellness programs. To see a list of free assisted living resources in Vacaville, please visit our Assisted Living in California page. Vacaville-area assisted living communities must adhere to the comprehensive set of state laws and regulations that all assisted living communities in California are required to follow. Visit our Assisted Living in California page for more information about these laws.